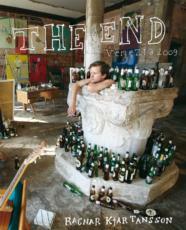 The End Venecia 2009 by Ragnar Kjartansson. Online store with art and photograpic books. Few Icelandic art exhibitions have generated the attention that Ragnar Kjartansson’s The End did at the Venice biennial in 2009. For over six months, from early June until the end of November, Ragnar painted his model, Páll Haukur Björnsson, who wore only a Speedo. The setting was a renaissance palace at the Canal Grande in Venice. While pieces by Mozart and Wagner were broadcast from a record player, suntanned guests observed the artist dressed in a white painter’s gown as he painted his model lazily smoking and drinking beer. As time passed the paintings piled up in the palace room, totalling well over one hundred by the end. The first exhibition of The End was at Hafnarborg in Hafnarfjörður, Iceland in January 2010 from where the paintings were moved to one of the world’s most prestigious art galleries, Luhring Augustine in New York. Together with the video of the same name, the paintings form one of the most magnificent pieces of art in Iceland, and have generated worldwide attention. In this publication, The End Venezia 2009, all the paintings are displayed. From the first piece in hazy June to the aggressive November pieces when the beer bottles and paintings have piled up, one can witness time at work with a man in a Speedo in the foreground.